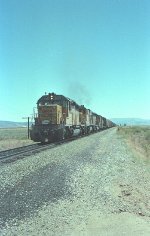 Title: WB freight leaves Beckwourth behind. Description: The Loyalton Branch diverges in the distance. Title: Union Pacific SD40-2 3593 - Desert Storm troop tribute unit - at Argo Yard, Seattle. April 7, 1991. Description: Union Pacific SD40-2 3593 - Desert Storm troop tribute unit - at Argo Yard, Seattle. April 7, 1991. Description: A UP freight sits tied down on the mainline in Mablevale, AR. Description: This Train was hard to get to. But a very thanks to the UP crew for letting me photograph there Power.